A cabal of American fascists wants to turn the British Isles into a new state of America. Its nefarious plan involves dropping an army of giant, one-eyed squids on top of London. This preemptive attack would incite a full-blown conflict with the British Empire and ultimately crown the United States as the dominant power in the world. God help the Queen. Before we reach the novel’s endgame, the extraordinary league of vagabonds must untangle a knot of political allegiances, wartime flashbacks, lost love affairs, and a flock of “terrible flying creatures” called raptors. The good news is that all efforts lead to the downfall of the American warmongers. 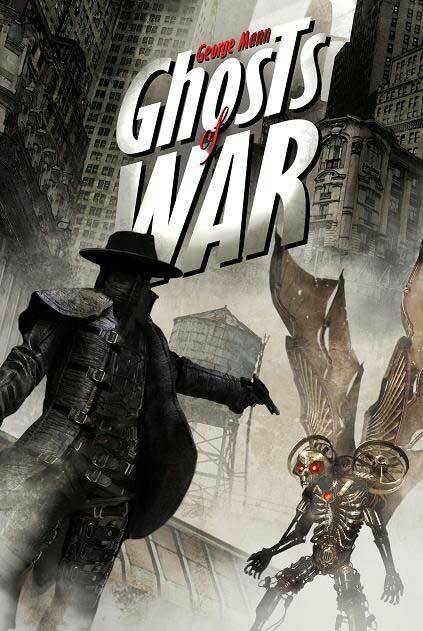 Ghosts of War is the second book in George Mann’s newish pulp/steampunk/superhero series. Without a doubt, it has many shining moments (the chittering raptors are pretty cool, we admit), but overall it’s basically a retread of the first book. Many of the power points remain the same, and there’s even a stand-in or two for characters who were previously dispatched. It’s almost like the author simply tweaked his first manuscript, sent it back to his publisher, and cashed his check. This entry was posted in New/Old Pulp, Published in 2011 and tagged George Mann, Ghosts of War, New Pulp. Bookmark the permalink.